He’s the greatest! He’s fantastic! We produced an HTML game to accompany the rebooted TV series. Working with the shows production and writing team, we created a game rich in brand authenticity. The game worked across mobile, tablet and desktop and soon gained a huge fanbase. 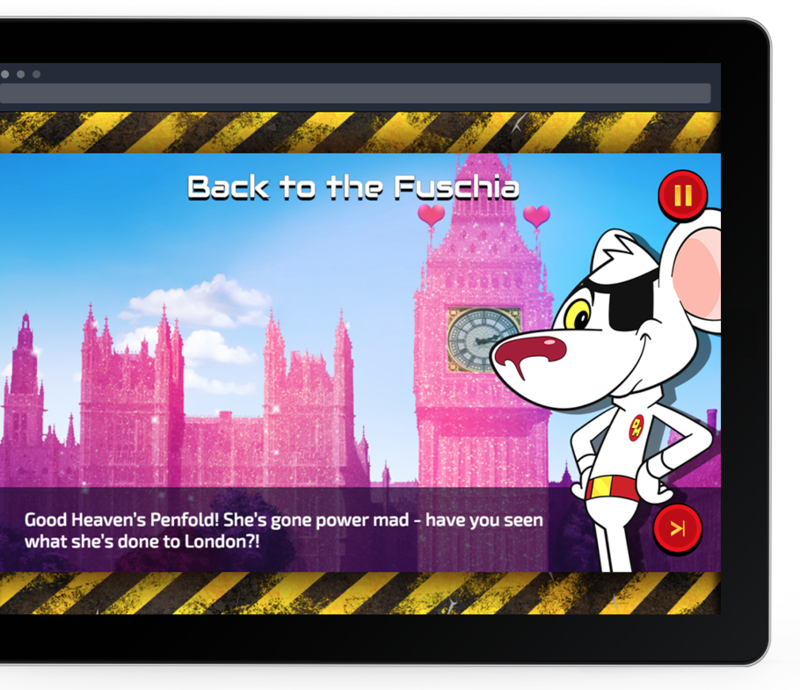 It was built with expansion in mind and was updated on 4 occasions with fresh content in the form of new worlds, levels, stories and characters to delight its loyal following, making it the CBBC's most popular HTML5 game for years, not days. 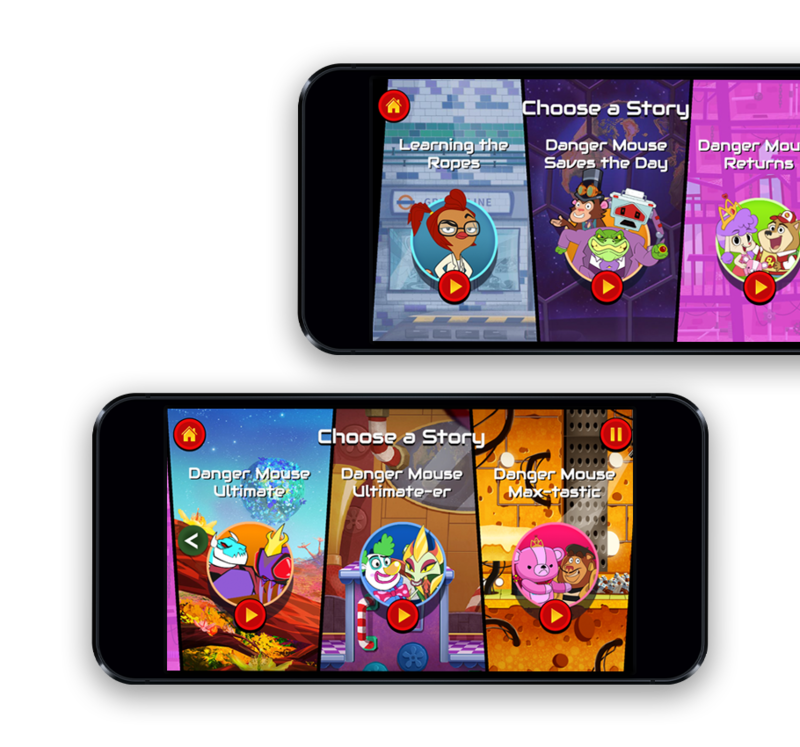 It didn't end there, we refreshed the UI / UX design of the game before packaging it and releasing it as an app for both iOS and Android users, reaching a 360 degree audience across the App and web world. The game was also repackaged and released for different broadcast platforms across the globe where it has won numerous industry plaudits. What game do we make to bring back a show loved by a nation of mums, dads and grandparents and make it cool for the kids? There was much that was clear about what the show would be and what our game would need to achieve. Danger Mouse was, and would be again, a smoother-than-silk, wise cracking all-action hero. Our game needed to grab player’s attention instantly and keep hold of it until the final boss was defeated. It was to be packed full of crazy humour and capture the charming and delicately balanced friendship between heroic DM and his cowardly (though effective!) sidekick, Penfold. There was actually a great deal to communicate – all to the backdrop of nonstop action. Looking at the HTML5 gaming landscape when we started DM one thing was clear - when it came to genuine action games there wasn’t a niche, rather a huge, gaping hole! Of course, challenges like this are what we get out of bed for. 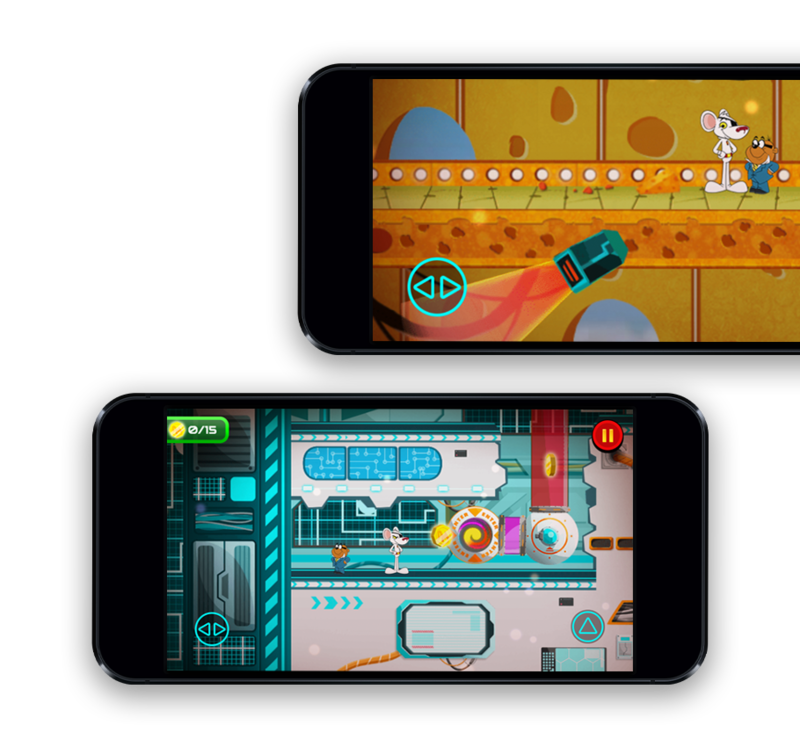 We rolled up our sleeves and put together the plan for the greatest touch-screen action platformer the mobile browser world had ever seen. Our proposition was a full on, level based ‘proper’ platformer that would capture the intensity and unstoppable pace of the TV show. Spanning five different locales from the show and of our own creation, we penned an adventure that would take players on a genuine adventure where they were firmly in the driving seat. One of the big challenges we had to overcome, and one of the clients greatest concerns was controlling the action on touch-screens where we would need to replicate left/right keys as well as two action buttons. Virtual D-pads even in apps had been hit and miss, and in the sphere of browser gaming, we also had to contend with things like iOS and the Safari browser’s eagerness to trigger its own UI when touched too near the top or bottom of the screen. Extensive user testing and multiple iterations got us to what has now been refined into Goodboy’s world class touch D-pad. The game had to not only look and play great, but also needed to be on-brand in terms of exactly how and what was said. We worked closely with the show’s writing team to generate each and every chapter setting and what the goals would be. We then created totally custom game art to make our worlds out of and ensured that the aesthetic fit was perfect. We then wrote the VO scripts for all of the game’s front end as well as intro / outro scene setting dialogue. The thrill of putting words in the mouths of the incredible acting talent the show had onboard was one that has not diminished even on our script for the fourth expansion! Putting tracking into a web project perhaps doesn’t rank that high on the scale of ‘fun tasks’ when making a game. However, with Danger Mouse: Saves the Day it was extremely insightful. The BBC tracked a lot of stuff for the game and as such once the first iteration launched we were armed to the teeth with data tracking to see how kids were getting on. After just a few days we were able to identify, adjust and push an updated version of the game that corrected a number of big bottlenecks that were holding up players. It also led to the creation of a ‘skip level’ feature so that kids stuck on a given level weren’t road-blocked there forever. The result was that whilst a familiar game fall-off curve did exist, for a ‘web game’ the rate of completion and progress into the game was exceptionally high.